Blogger jump break is a hyperlink which directs readers to post page for full post. If you use jump break in your post the above portion would be displayed on homepage and jump break link will direct to the full post page if the visitor interested in reading whole post or story. 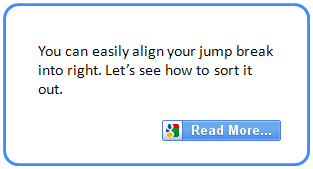 However, by default, Blogger jump break is left aligned. It may not a problem with you at all. But if you think it would be better if it was right aligned and seems it's more matched to your blog template and design by doing it, you can change the alignment by accessing your blog template easily. 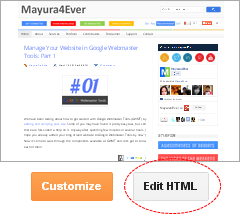 If you wish to try it out on your blog, now it's your turn to follow steps. 5. Now search for following code in your template. 6. Replace that tag with the one below. 8. Save Template after confirmation. * If you are interested in, you can convert jump break hyperlink into an eye catching image. If you need, read Turn Jump Break into an Image in Blogger. hey , do you now how to change the color of the "Read More" text ? Thank you, thank you, thank you! Finally I have jump in my blog -couldn't stand it in left, and couldn't find the place to chance it before found your pictures. Thank you! Great! You're most welcome dear :) I couldn't stand having it aligned to left either. Glad you have made it with the help of this tutorial. Hi again, I have changed it to the right but my "Linkedwithin" also aligned to the right. Could you please recommend something to me for "Linkedwithin" alignment. Thanks. Looks like the LinkWithin widget might have falls into the same DIV. Did you try removing LinkWithin and installing it again?